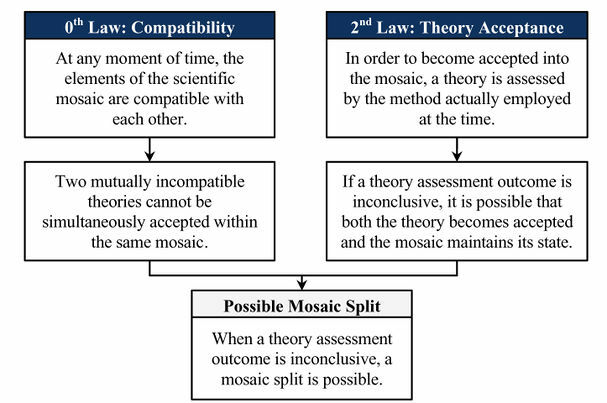 An attempt to answer the question of Mechanism of Mosaic Split which states "When a theory assessment outcome is inconclusive, a mosaic split is possible." Possible Mosaic Split theorem was formulated by Hakob Barseghyan in 2015.1 It is currently accepted by Scientonomy community as the best available theory on the subject. Like the broader topic of the Mechanism of Mosaic Split the matter of possible mosaic split has classically been regarded as a case of divergent belief systems in communities, with the caveat that the divergence in the community is contingent, not necessary. As such pre-scientonomic approaches are those that are considerate of situations in which community beliefs may diverge but will not do so necessarily. The obvious starting point for this sort of discussion is Thomas Kuhn, for whom any case of scientific change is merely contingent owing to the nature of scientific revolutions.2pp. 146-149 In terms of the mechanism itself, Kuhn suggested that the actual process of theory choice ultimately comes down to the deliberation of values inherent to scientific endeavors, which together constitute the "shared basis for theory choice".3p. 103 A divergence within the community implies a conflict in the value-assessment that the community has undertaken when deliberating between two theories. In such cases the emergence of two distinct communities with two different sets of theories arises due to the possibility of differing beliefs with regards to values. These debates do not necessarily end in a division in the community, so it is clear that we are still within the domain of contingent divergence of belief. Possible Mosaic Split theorem (Barseghyan-2015) is an attempt to answer the following question: What happens to a mosaic when two or more similar theories are considered equally acceptable by a scientific community? Under what conditions does a mosaic split occur? What happens to a mosaic when it is transformed into two or more mosaics? 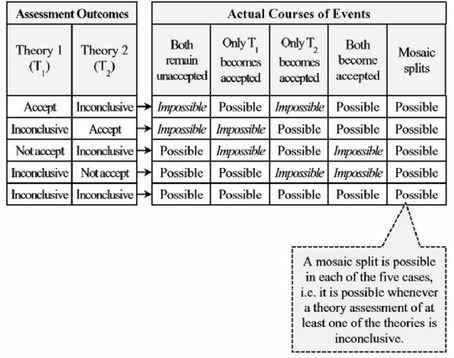 As pictured, the possible mosaic split theorem follows as a deductive consequence of the second and zeroth laws, given a situation a situation where the assessment of two theories obtains an inconclusive result. This will happen when it is unclear whether or not a theory satisfies the employed method of the community. We can easily imagine such a scenario: suppose we have a method for assessing theories about the efficacy of new pharmaceuticals that says "accept that the pharmaceutical is effective only if a clinically significant result is obtained in a sufficient number of randomized controlled trials." The wording of the method is such that it requires a significant degree of judgement on the part of the community - what constitutes 'clinical significance' and a 'sufficient number' of trials will vary from person to person and by context. This introduces the possibility of mosaic split when it is unclear if two contender theories satisfy this requirement. Carrying on the above example, suppose two drugs are being tested for some condition C: drugs A and B. We'll call T1 the theory that A is more effective than B at treating condition C and T2 the theory that B is more effective than A at treating condition C. These two theories are not compatible, and so cannot both be elements of the mosaic according to the zeroth law. Suppose further that both are assessed by the method of the time, meaning that both are subject to double blind trials. In these trials drug A is clearly superior to drug B at inducing clinical remission, but drug B has fewer side effects and is still more effective than a placebo and has had more studies conducted. Even if we accept T1 we may have reason to suspect that T2 better satisfies the method. We can interpret this in two ways: by supposing that our assessment shows that we should accept T1 and that our assessment is inconclusive about T2 or by taking both assessments to be inconclusive. In the first case it is permissible according to the second law to accept T1 and to either accept or reject T2, and in the second case both may be accepted or rejected. Because any time an assessment outcome is inconclusive we may either accept or reject the theory being assessed we always face the possibility that one subsection of the community will reject the theory and another subsection will accept it. In these cases the two communities now bear distinct mosaics and a mosaic split has occurred. However it is important to note that the ambiguity inherent in inconclusive assessments means that it is never entailed that there will be competing subsections of the community. A community may, in the face of an inconclusive assessment, collectively agree to accept or reject the theory being assessed. Thus, in cases with an inconclusive assessment mosaic split is possible but never necessarily entailed by the circumstances. This page was last modified on 22 June 2017, at 16:04.